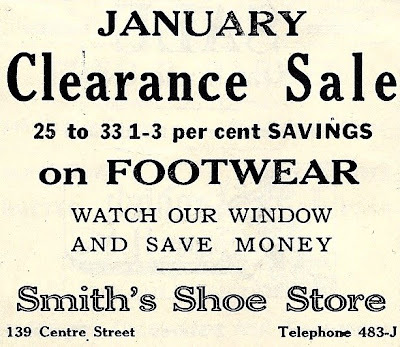 Smith's Shoe Store operated briefly in 1922-23 on Center Street. The Smith firm appears to have suceeded to the business of George H. Keedwell & Son which retailed boots and shoes, and was noted for also selling damaged samples and cancellations from the Leonard, Shaw & Dean shoe manufactory in Middleborough for which Kenneth B. Keedwell had formerly worked. Smith's seems to have operated for one year only. On March 16, 1923, it was advertising an "Assignment Sale" and there appears to be no further record of the business.